Intuitive screens make users more productive. You can use SAP Screen Personas to simplify ERP screens in ECC, Business Suite on HANA, or SAP S/4HANA. 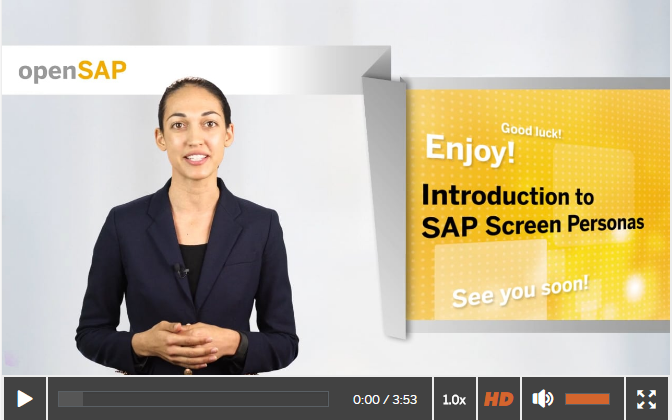 Introduction to SAP Screen Personas is the new openSAP course that teaches you how you can transform complex screens, including your custom transactions into a modern interface. Introduction to SAP Screen Personas is an introductory course that focuses on how to build simple flavors. The course will show you around SAP Screen Personas and explain how to simplify business processes. You’ll learn about merging tabs, building using themes, creating simple scripts, and simplifying an end-to-end scenario. Finally, you’ll learn about accelerating flavor development with a focus leveraging pre-existing content in our Flavor Gallery, including reusable templates. Introduction to SAP Screen Personas starts on openSAP from February 22 and is now open for enrollment. The course is aimed at designers and developers that are new to SAP Screen Personas, LOB managers who need to simplify screens for their departments, and SAP S/4HANA customers that want to know how to simplify transactions.